The active ingredient in the fruit’s rind, hydroxycitric acid, or HCA, has boosted fat-burning and cut back appetite in studies. It appears to block an enzyme called citrate lyase, which your body uses to make fat. It also raises levels of the brain chemical serotonin, which may make you feel less hungry. Exercising regularly and when implemented into your diet, Natures Craft pure Garcinia Cambogia is destined to give you results you will love! 100% PURE GARCINIA CAMBOGIA EXTRACT Natures Craft pure HCA extract with zero fillers is the best in its class. Unlock your body’s fullest potential with our high grade – rapid dissolving – premium capsules for weight loss. #1 BEST APPETITE SUPPRESANT Achieve the best results, FAST! Eliminate cravings with our inexpensive, dependable weight loss supplements. Potent Hydroxycitric Acid capsules works great with men and women. Stop overeating by naturally increasing serotonin levels with our thermogenic formula which produces heat through metabolic stimulation. LOSE WEIGHT FAST ! Garcinia Cambogia works by decreasing your current amount of belly fat. It specifically zeros in on belly fat and helps to eliminate it for both male and female users. Helps keep your bowel movements in check to help detoxify and cleanse your body. Get rid of stubborn belly fat fast without the need of changing your diet. 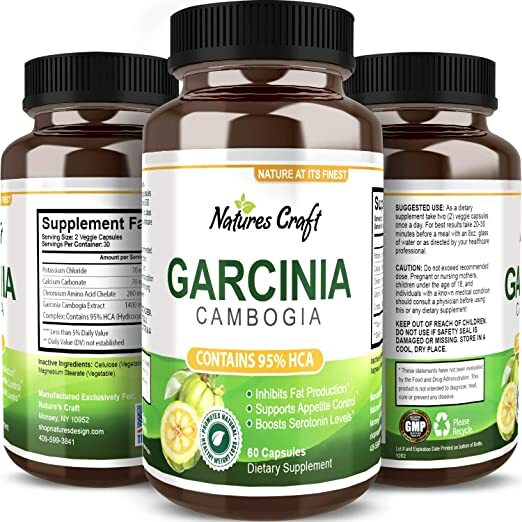 95% HCA CONTENT – Our Garcinia Cambogia weight loss supplement boasts 95% HCA, one of the highest available on the market. Many other garcinia tablets and pills only offer between 50% to 75% HCA, so always check the label! 100% MONEY-BACK – We are so confident you will love our low cost natural supplements that if you are not 100% satisfied, we will be pleased to refund you every last penny easily. Purchase now before our stock runs out knowing that we are here to make you happy no matter what.